You know how I’m always banging on about how brewers should make an effort to make their beers stand out a bit? Well here’s a prime example of how Oxfordshire Ales have managed to do just that. I’ve no idea whether this was a conscious effort, or whether it was just a serendipitous incident that occurred during a test batch – either way it’s resulted in a beer that’s just different enough to stand out from the crowd. 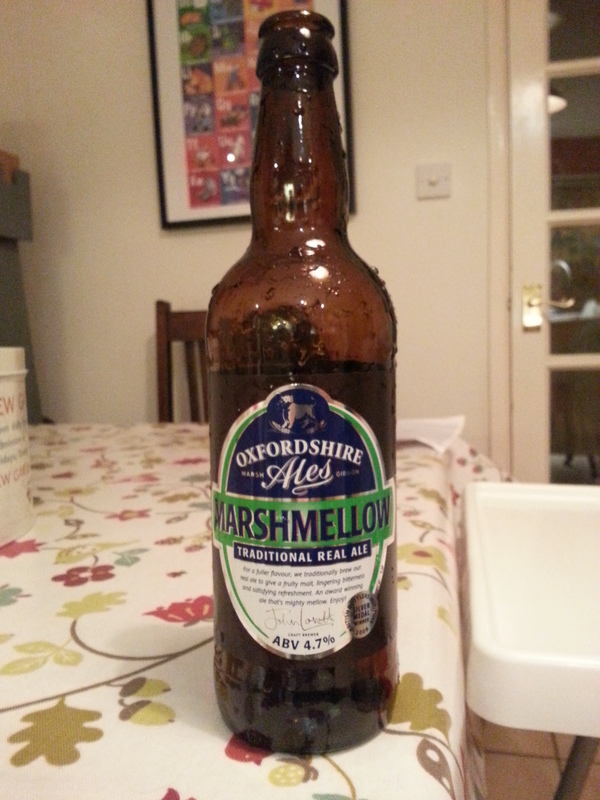 Marsh Mellow comes out of the bottle a wholesome russett-brown colour, looking every inch an autumnal sort of beer. The head is thinnish and hangs about a bit, rather than just fizzling away. The nose is decently malty, with some notes background notes of wood, there’s also the slightest bit of hop flavour too. Now we get to the interesting part – the taste…which is sweetly malty and almost perfumed, but not a perfume that I normally associate with hops. The weird thing is that the taste does vaguely me of marshmallows, this being further enhanced by the odd, rounded softness in the mouth-feel. If pushed to provide a theory I reckon it’s down to residual dextrins – brought about by a higher-than-normal mashing temperature, maybe combined with a “different” sort of yeast strain…and maybe even an elevated fermentation temperature or an open ferment. I’ve no idea, really. Intention or accident, it’s nothing if not distinct. The finish is strongly malty with a satisfying dryness, a faint,residual sourish note and not a trace of that original perfumed type flavour, which reinforces (in my mind) the theory about dextrins, higher temperatures, etc.